The Mad Dash Annex Log Cabin Playhouse is an incredible double storey playhouse in which your child will be able to enjoy many hours of fun. With multiple windows and a charming stable door, the interior is light and airy, creating a comfortable and inviting environment in which to play. This is simply sensational and will give the children hours of pleasure. 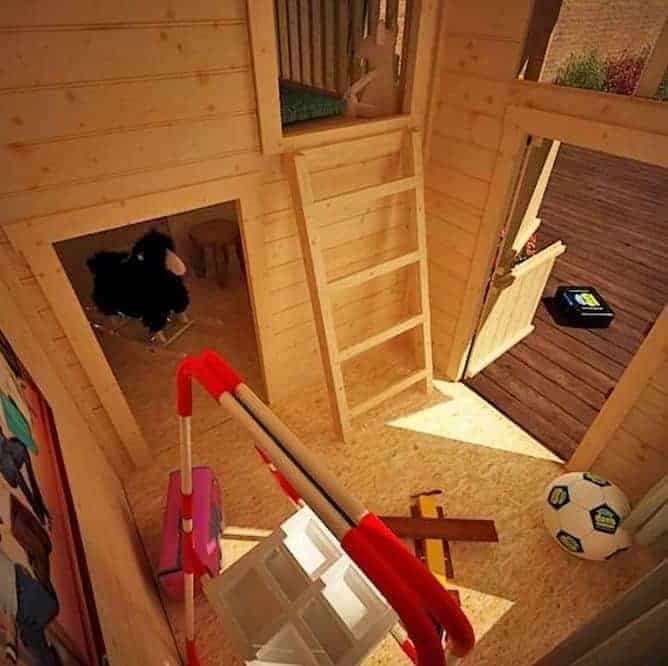 It is a fantastically sized playhouse on two floors, with two downstairs rooms as well as an upstairs; you’ll be hard pushed to get them back inside your house to go to bed! The front door is stable style and there are five windows with co-ordinating window boxes. Shutters surround the windows giving this house even more charm and it has an apex roof. All of this for just £999.49 it’s a great investment that will last for years. 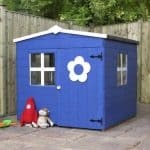 Constructed from hard wearing and long lasting wood with tongue and groove boards for extra strength the children will adore playing house while you spend quality time in your garden. With a superb 10x8ft double storey interior, there is plenty of room for your child as well as all of their little friends to enjoy many hours of fun and imaginative play. A fantastic playhouse in every aspect. 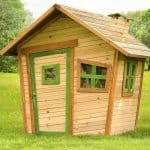 The Mad Dash Annex Log Cabin Wooden Playhouse: How safe is it? 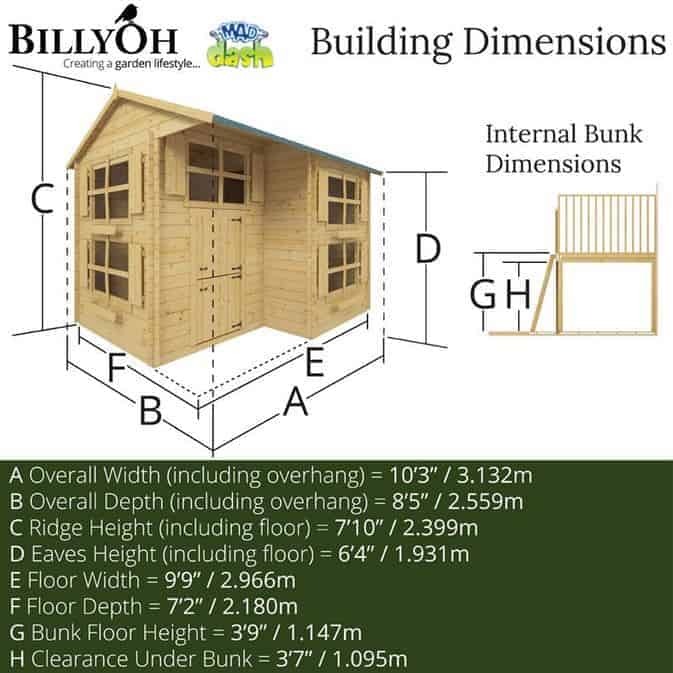 The Mad Dash Annex Log Cabin Playhouse may look amazing from all angles but the most important question for every parent and carer is will it be safe for my child? 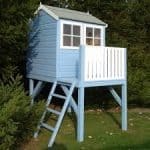 Here at whatshed.co.uk we take a look at any aspects of the playhouse that may cause concern for safety as well as looking in more detail at the superb features that the playhouse has to offer. 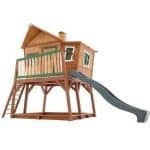 Playhouse: The playhouse has a fantastic 10x8ft interior that comprises of a main floor and a raised bunk which is accessed by ladder. The tongue and groove interlocking boards provide a sturdy structure and are smooth and rounded to provide a safe play environment. Windows: With multiple windows on both storeys the playhouse interior is filled with light and has an airy feel due to the 7ft10 height. The windows do not have an open and close function, therefore preventing any accidents from the raised height of the second storey and any incidents involving trapped fingers. Door: The door is a charming stable door design that provides a nice access point for small children. With handles on both parts of the door, your child’s safety has been taken into consideration, however care must be taken that small fingers don’t become trapped in the middle of the two doors. Raised bunk: The raised bunk is supported by strong wooden joists and accessed by ladder. The ladder is fixed to both the bunk and the floor to allay any concerns about safety. Smaller children will need to be shown how to climb up and down the ladder safely to avoid any accidents. 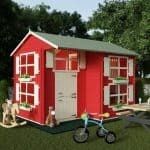 The Mad Dash Annex Log Cabin Wooden Playhouse: How easy to build? Bigger is better when it comes to playhouses but what about when it comes to assembling them? The Mad Dash annex playhouse will arrive at your door in a flat packed package, with all of the timber panels, roofing, glazing, fixtures and fittings that you will need for assembly. A basic set of tools will be required and it is recommended that two people work on assembly together for both safety reasons and for the sake of time. We expect that this particular playhouse will be built within a day. 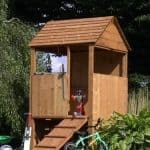 The Mad Dash Annex Log Cabin Wooden Playhouse: What is the overall quality like? Mad Dash design and manufacture a range of children’s playhouses within the United Kingdom to provide children of all ages with a safe environment in which to enjoy many hours of imaginative play. The annex log cabin playhouse is constructed from quality materials including strong timber, tongue and groove interlocking boards and solid framing that give the structure a sturdy and rigidity that you can have confidence in to last for many years to come. The 19mm tongue and groove boards are rounded with no sharp edges to be seen. It is recommended that a wood preservative treatment be applied upon assembly to give the timber boards a long life, preventing rot and other issues further down the track. 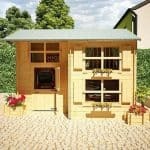 The playhouse is fairly low maintenance and should only require a clean every so often to maintain its smart appearance within your garden. To clean, simply hose down with water or spot clean with a sponge and soapy solution for sparkling windows. What an incredible playhouse for boys and girls of all ages to enjoy. 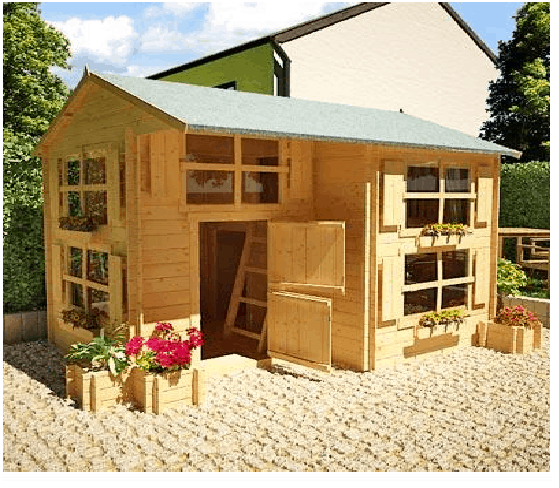 Although many playhouses are aimed at the youngest children, this is definitely one playhouse that could be an attractive option for slightly older children wanting a garden hideaway. 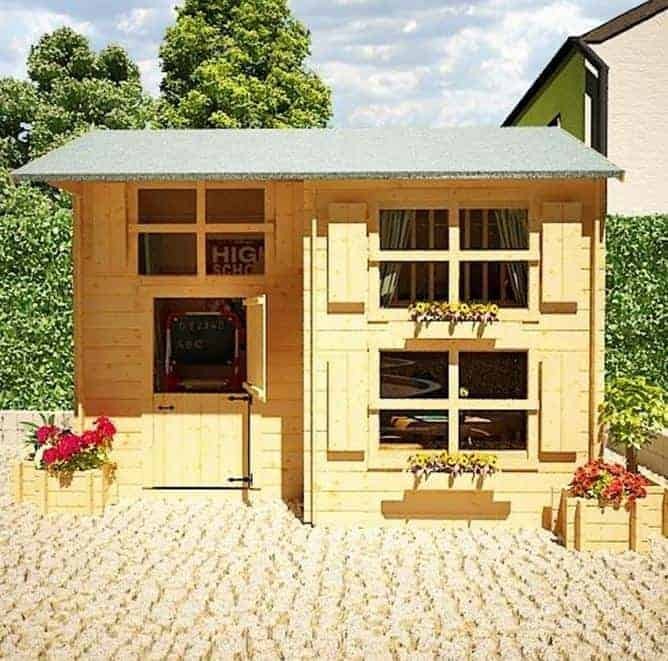 With a raised bunk and a light and airy feel, this attractive and large playhouse could be a superb feature within your garden. Don’t miss out on this amazing model!